What is the continuing education requirement for Advanced Practice Registered Nurses with prescriptive authority? When will the requirement be in effect? Is this a one-time requirement or will licensees be required to earn continuing education in controlled substances prescribing on an ongoing basis? May I claim credit for continuing education hours I have already completed if the course content fulfills the requirements stated in the rule? What if I am at the end of my continuing education cycle when the rule takes effect but I have not completed any continuing education that fulfills the requirement? When does my continuing education cycle end? Are any licensees be exempt from the new continuing education requirement? I prescribe medications, including controlled substances (e.g. hormones, psychoactive medications, stimulants), but I do not prescribe ANY opioids. Do I have to comply with the requirement? How will licensees find continuing education courses that fulfill the requirement? What education topics must be covered for courses to count towards the new continuing education requirement? How will the Board communicate the controlled substance requirements to licensees? I am a Advanced Practice Registered Nurse who only orders or administers controlled substances to hospitalized patients, patients at an ambulatory care surgery or procedure center, or similar facility (e.g., Nurse Practitioner/Certifed Nurse Midwife working in hospitalist roles, out-patient procedural units, etc.). Why is North Carolina Board of Nursing implementing a controlled substances continuing education requirement? Who is subject to the controlled substance continuing education requirement? What is the Controlled Substance Reporting System (CSRS)? I do not prescribe controlled substances, am I required to enroll in the Controlled Substance Reporting System (CSRS)? How does the Board notify licensees of the requirement for the Controlled Substance Reporting System (CSRS)? I work in a federal healthcare system, am I required to enroll and utilize the Controlled Substance Reporting System (CSRS)? Who is authorized to access the Controlled Substance Reporting System (CSRS)? Can I use the Controlled Substance Reporting System (CSRS) to monitor patient prescriptions across state/jurisdictional boarders? Are Advanced Practice Registered Nurse prescribers authorized to prescribe Medically Assisted Therapy (MAT)? What is the STOP Act? Is the goal of the STOP Act to get clinicians with prescriptive authority to stop treating chronic pain? What medications does the STOP Act impact? When does the Personal consultation with the supervising physician for Schedule II and III Opioids go into effect? How is consultation for prescribing controlled substances defined? Does the STOP Act apply to Advanced Practice Registered Nurse prescribers who do not work in pain management settings? The continuing education requirements for Advanced Practice Registered Nurses with prescriptive authority are stipulated in North Carolina Administrative Code 21 NCAC 36 .0807 and 21 NCAC 33 .0111. Advanced Practice Registered Nurses who prescribe controlled substances shall complete a minimum of one contact hour of continuing education addressing controlled substance prescribing practices, signs of the abuse or misuse of controlled substances, and controlled substance prescribing for chronic pain management. This one contact hour is inclusive of (not an expansion of) the total contact hours required each year during the annual renewal cycle. Documentation shall be maintained by the nurse practitioner for the previous five calendar years and made available upon request to either Board. The new requirement is effective March 1, 2017. Any licensee whose continuing education cycle renews in 2017 and whose birthday is on or after March 1, 2017 will be required to fulfill the new continuing education requirement. The date on which you renew your license does not affect whether you are required to fulfill the new continuing education requirement. Yes. If the continuing education course is completed during a cycle that renews on or after March 1, 2017, then the credit can be claimed even if the course was taken prior to March 1, 2017 (Note: again, the course must have been completed within that continuing education/approval cycle. *See Continuing Education Requirements). Licensees are expected to fulfill the continuing education requirement if the continuing education cycle ends on or after March 1, 2017, even if they have otherwise fulfilled their requisite continuing education credits. Yes. Licensees who have not prescribed ANY controlled substances (opioid or non-opioid) since they last renewed are exempt from the requirement. No. Only licensees who prescribed controlled substances (including non-opioids) during their most recent continuing education cycle are subject to the requirement. Yes. The requirement applies to all prescribers who prescribed ANY controlled substances (including non-opioids) during their most recent continuing education cycle. It is not possible for the Board of Nursing to maintain a current and complete list of available courses that meet the controlled substance requirement. There are many existing online and in-person continuing education courses that meet the Continuing Education Requirements that covers “controlled substances prescribing practices, recognizing signs of the abuse or misuse of controlled substances, and controlled substance prescribing for chronic pain management,” as stated in North Carolina Administrative Code 21 NCAC 36 .0807 and 21 NCAC 33 .0111. The North Carolina Board of Nursing is continually evaluating the Board Sponsored Offerings to meet the needs of nurses licensed in North Carolina. Please see the following complementary continuing education offerings on the North Carolina Board of Nursing website that are designed for authorized Advanced Practice Registered Nurse prescribers. The North Carolina Board of Nursing will post regular updates and guidance on its website, in the quarterly licensee newsletter, the Bulletin and through direct email communication. The North Carolina Board of Nursing will also email licensees who are seeking initial approval, annual renewal of approval or who apply for a change in supervising physicians to remind them of the new requirement. The North Carolina Board of Nursing staff members are available to respond to inquiries sent to APRN Practice using the Contact Us Form. Yes. Licensees who prescribe, order, supply, administer, or otherwise provide controlled substances to patients under their care must complete the mandated continuing education. While there may be a semantic and possibly even practical distinction between prescribing to patients by writing a prescription and ordering medications to hospitalized patients, the Board has determined that hospital or institutional based licensees of this Board who order and/or administer any controlled substance to a patient using either their own DEA registration or by means of an institutional DEA registration, directly or indirectly, are required to obtain the continuing education. 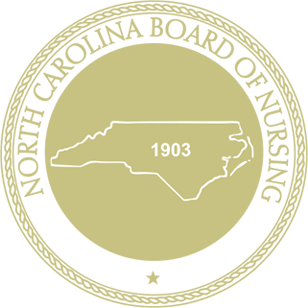 The mission of the North Carolina Board of Nursing is to protect the public by regulating the practice of nursing. Requiring continuing education in controlled substances prescribing and related topics ensure that licensees who prescribe controlled substances, particularly opioids, do so in a manner that is safe, appropriate and consistent with current standards of care. These requirements are respectively stipulated for the practice of nurse practitioners and certified nurse midwives in the North Carolina Administrative Code 21 NCAC 36 .0807 and 21 NCAC 33 .0111. Every licensee who prescribe controlled substances. The North Carolina Controlled Substance Reporting System (NCCSRS), frequently truncated to CSRS, is a statewide reporting system was established by North Carolina law to improve the state’s ability to identify people who abuse and misuse prescription drugs classified as Schedule II-V controlled substances (Defined). It is also meant to assist clinicians in identifying and referring for treatment patients misusing controlled substances. The North Carolina Commission for, and the Division of Mental Health, Developmental Disabilities and Substance Abuse Services make rules and manage the program. (For more information, visit the North Carolina General Assembly: Chapter 90, Article 5 and Senate Bill 222). No. Statute § 90-113.74A stipulates that within 30 days after obtaining an initial or renewal license (which is interpreted as a valid DEA registration) that confers the authority to prescribe a controlled substance for the purpose of providing medical care for a patient, the licensee shall demonstrate to the satisfaction of the licensing board that he or she is registered for access to the controlled substances reporting system. A violation of this section may constitute cause for the licensing board having jurisdiction over the licensee to suspend or revoke the license. (2016-94, s. 12F.7(c). North Carolina Board of Nursing will post regular updates and guidance on its website, in the quarterly licensee newsletter, the Bulletin and through direct email communication. North Carolina Board of Nursing will also email licensees who are seeking initial approval, annual renewal of approval or who apply for a change in supervising physicians to remind them of the new requirement. The North Carolina Board of Nursing staff members are available to respond to inquiries sent to APRN Practice using the Contact Us Form. Yes. Federal Health Systems i.e. the Veteran’s Administration, utilize the Controlled Substance Reporting System using a unique institutional/provider suffix for monitoring. Licensees enrolled in federal systems are directed to check with their administration regarding their unique suffix. The prescriber or dispenser. Only the person with that log on, not their nurse, not their office manager, not another prescriber. Each practitioner in the office has to have their own login. The Controlled Substance Reporting System began allowing delegate accounts in 2014 where an already approved user may delegate the task of running queries to someone else in the office. This delegate will apply online and be given their own individual username and password. Never share your username and password with anyone. No. At this time the Controlled Substance Reporting System is a statewide reporting system that does not cross state/jurisdictional borders. Yes. The Advanced Practice Registered Nurse roles that have prescriptive authority in North Carolina includes the Certified Nurse Midwife and the Nurse Practitioner roles. Advanced Practice Registered Nurses who have prescriptive authority in North Carolina and have met the following requirements, s/he are authorized to prescribe Medically Assisted Therapy. Session Law 2107-74, Strengthen Opioid Misuse Prevention (STOP ACT) H243/S175 was signed into law on June 29, 2017 in order to combat the nationwide opioid epidemic that has had a severe impact in North Carolina. The objective of this law is to reduce or eliminate inappropriate opioid prescribing. Several provisions apply to Advanced Practice Registered Nurse (APRN) prescribers (Nurse Practitioners [NP] and Certified Nurse Midwives [CNM]) who prescribe targeted controlled substances. No. The objective of the STOP Act is to ensure opioid prescribing is safe and appropriate. The rate of patient deaths due to opioid overdose has increased significantly over the past several years, to the point where the state of North Carolina considers it to be a public health crisis. Through the mission of public protection by regulating the practice of nursing, North Carolina Board of Nursing stands with other regulatory boards and policy thought leaders in the recognition that chronic pain is a legitimate health issue requiring appropriate, evidence-based care. Provisions of the STOP Act only apply to “targeted controlled substances” which includes all schedule II and III opioids as listed in listed in G.S. 90-90(1) & (2) and G.S. 90-91(d). The patient is being treated by a facility that primarily engages in the treatment of pain by prescribing narcotic medications or advertises in any medium for any type of pain management services. The therapeutic use of the targeted controlled substance will or is expected to exceed a period of 30 days. Yes. The North Carolina Board of Nursing expects every licensee prescribing opioids for the treatment of pain to provide diagnoses, treatments, and health record documentation consistent with the standard of care in North Carolina. When a targeted controlled substance is continuously prescribed to the same patient, the Advanced Practice Registered Nurse prescriber shall consult with the supervising physician at least once every 90 days to verify that the prescription remains medically appropriate for the patient. The consultation shall be documented in the patient’s health record. Advanced Practice Registered Nurse prescribers prescribing targeted controlled substances in settings that do not specialize or advertise for the treatment of pain by prescribing narcotic medications or any type of pain management services (including but not limited to primary care and sub-specialty practices) shall utilize the Policy for the Use of Opiates for the Treatment of Pain and practice within the prescriptive authority established in NC law and administrative code 21 NCAC 36 .0809 Nurse Practitioners and § 90-178.3. (b) Regulation of Midwifery.